Not new news, but needs to be kept in the forefront. Thanks, Cal. I love coral - they are living animals - this is sad. Coral reef picture is pretty. 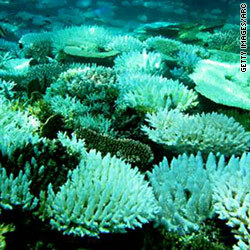 Now people know that heating the water, and polluting the water near coral reefs can destroy coral reefs. If people would stop putting the hot water, and the pollution near the coral reefs, then people will enjoy the coral reefs more. Thank you for the posting.. This sounds like terrible news. Humanity must reduce its use of fossil fuels, eat less meat, and save forests. Terrible what's happening to our planet. Thank you Cal.